Drinor granted business development support to just over four million from the Energy Agency. The money will go to developing and implementing a large-scale commercialization of an innovative and energy-saving process that drains the biomass. In the first stage of the drying process is estimated to save up to 95 percent energy. Dewatering biomaterials, such as sawdust for pellet production, now require large amounts of energy. According to current procedure it is done with thermal energy, that is, the water evaporates from the material. 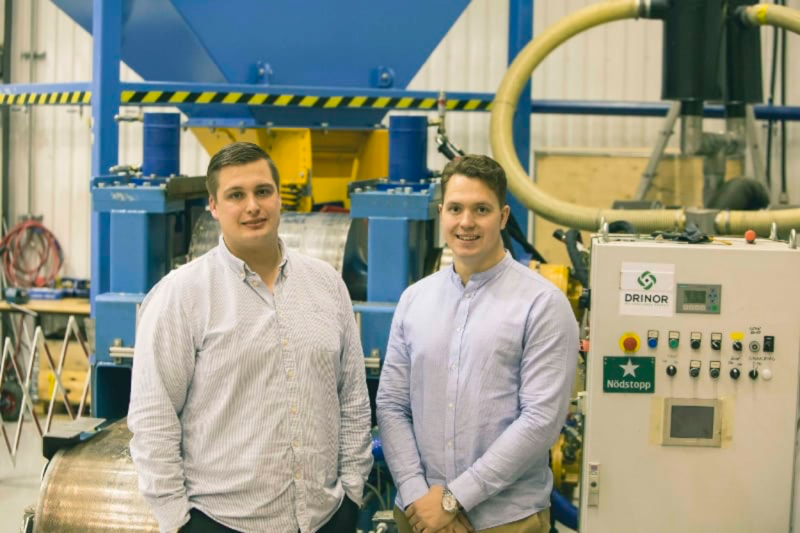 But with Drinors technology, based on a simple principle in which the material is pressed in a roll nip, about half of the water is squeezed out mechanically. This provides a significant energy savings and increases capacity in existing facilities. The innovation does not replace the thermal principle but is an effective complement. The support from the Swedish Energy Agency will be used to validate the technology on an industrial full scale. It is a crucial step to reach commercialization of the technology. The Continuous Dewatering Press (CDP) can be described as a multi-tool, it has very many uses since it can dewater various materials. In a first stage in the development of technology has Drinor chosen to focus on the pellet market. Carl Romlin and Alexander Thelander, the men behind Drinor, great opportunities to make a difference. – It is an industry where margins are not big, where the demand for a solution to increase profits is extra-large. It is hoped that the CDP contribute to just that, they explain. Future Potential for the CDP is large. Only in the Swedish pellet industry is estimated to be able to reduce energy equivalent of heating 25,000 homes and transport reduce the need for biofuel transport by two thirds. – And in the first step of the drying process, it can reduce energy consumption up to 95 percent. It also increases the production capacity and process control, says Carl Romlin. Interest in the CDP is large, even outside the country. – At first, we want to establish a home market in the Nordic countries, but we have interested parties from long distance, such as Canada, Indonesia and Australia, says Alexander Thelander. – Dewatering is a global problem, so there is a strong interest to find a solution for the drying of biomaterials, explains Carl.